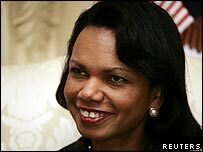 A visit by US Secretary of State Condoleezza Rice to a mosque in Jack Straw's constituency has been cancelled due to fears of anti-war protests. Muslims opposed to her trip to the Masjide Al Hidayah mosque in Blackburn had planned to demonstrate there, spokesman Ibrahim Masters said. He said high-profile visits should be used to benefit the Muslim community. "I feel extremely disappointed and angry with some people because they've proposed this action," he said. "The visit wasn't cancelled because we don't like Condoleezza Rice. "What these people had threatened to do was invade the mosque during dawn prayers. "I feel extremely disappointed and angry, to be honest with you, with some people because they've proposed this action," Mr Masters continued. "I feel that we will not get this opportunity again. "We have to use these type of visits - very high-profile visits - for our benefit and that's what we proposed to do. "We are extremely unlikely to get another opportunity like this to show the non-Muslim world that Mosques have nothing to hide and non-Muslims have nothing to fear." He said the decision followed a meeting between the mosque's governing committee and members of the Stop the War Coalition. Dr Rice's official visit to Blackburn and Liverpool begins on Friday. Her call at the mosque on Millham Street was cancelled over safety concerns. However, plans for her to meet staff at the 1,200-pupil Pleckgate High School in Blackburn have not been affected, despite up to 50 people protesting outside the school on Thursday. 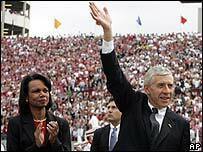 Dr Rice is visiting Blackburn to repay a visit Foreign Secretary Jack Straw made to her home town in Alabama in 2005. Mr Straw said on Thursday: "I'm disappointed that it is not possible for Secretary Rice to visit this mosque but she is going to see plenty else of Blackburn, and will be able to meet many many members of the Asian community in town, so I'm looking forward to the visit, more importantly so is she." In addition to meeting dignitaries in Mr Straw's constituency, she will also attend a gala concert at the Liverpool Philharmonic. She will also attend Blackburn Cathedral on Saturday. The Dean of Blackburn, the Very Rev Christopher Armstrong, said her visit would "promote peace and justice in the global community." "I am delighted that they will both be able to spend time with us, sharing in some of the reflective resources which we provide for the whole community," he added. A Foreign Office spokeswoman said: "It's a pity that we will not be visiting a mosque in Blackburn. "Everything we are doing on this visit is being done with respect to the communities involved, taking their views into consideration. "We are looking forward to meeting Muslim and civic leaders during the visit." Stop the War is planning demonstrations in Blackburn on Saturday morning and in Liverpool before the concert. Dr Rice has been invited to the Royal Liverpool Philharmonic orchestra concert to celebrate the city's status as European Capital of Culture 2008. The trip has already caused controversy with poet Roger McGough pulling out of plans to compere the event. Dr Rice is also due at the Liverpool Institute of Performing Arts (LIPA) on Friday evening, where the choir will sing to her.